1The location of the European Union (EU) headquarters – notably of the Commission, Council, and Parliament and their predecessors – has been an object of debate since 1952. For more than five decades these organs have been located in three cities–Brussels, Strasbourg, and Luxembourg. In 1992, the Council of Edinburgh confirmed the formerly temporary seats as official headquarters of the EU. Since then, newly created decentralized agencies have settled in some other 20 cities. 2The question of how to handle this decentralization or polycentricity is again on the table as Europeans discuss the location of the European Parliament. As a result of the particular history of the creation and location of the European institutions, the Parliament holds its week-long monthly plenary sessions in Strasbourg, has its secretariat in Luxembourg, and both convenes extraordinary sessions and does its everyday work in Brussels. Such extreme decentralization hampers its work. 3For several decades the Parliament has requested a single location close to the headquarters of the Commission and the Council of the EU in Brussels. Its attempts to choose a capital for Europe or at least to determine its own site, however, failed as a result of opposition by the member states. 4A single capital might be more effective for the EU’s administrative purposes, but this is not an option given the particularities of EU unification, the interests of member states, and the desire of some host cities to limit the number of EU employees in their walls. In contrast, polycentricity has the advantage of bringing the EU closer to its citizens. 5An innovative interpretation of the emergence of a polycentric and opportunistic capital of Europe may provide a basis for a more comprehensive analysis and argument for the construction of a capital on a par with the innovative character and multilayered structure of the EU itself. Nonetheless, careful planning is necessary: to ensure that the continuing decentralization of specific institutions does not impede their effectiveness, to respond to the host cities’ special needs due to their particular history, size, or political structure, and, most importantly, to provide citizens with ample opportunities to have their voices heard as easily as those of organized lobbying groups. 6The emergence of a capital spread out over multiple locations, what I call a polycentric capital, is not the result of an explicit policy, but rather of the particularities of the creation and formation of the EU in response to the interests of the member states. 7In traditional national capitals – Paris being the most striking example – the national government has consistently affirmed its power in urban and built form. In contrast, European institutions lacked the power and the will to determine the form of their own headquarters. Instead, national and local, public and private, forces used the European presence to increase the economic power and symbolism of each locality. I term this an opportunistic capital. 8For example, the Berlaymont building, the headquarters of the Commission, was located and built in Brussels almost haphazardly. It was planned by a private investor and financed by the Belgian government. They constructed it over ten years, on a layout appropriate for a Belgian ministry, and in conjunction with a local subway line. When the building was finished it was too small and badly designed to host all European institutions in Brussels, but eventually the Commission accepted it. This decision effectively fixed the location of other European institutions around the rond-place Schuman, and it is now the heart of the European district in Brussels. 9A different facet of Europe is thus being built in each of the European headquarters, each depending on local, regional, and national land use and planning policies, as I have shown elsewhere. 10In order to make a polycentric and opportunistic capital work, this article proposes: 1. A polycentric policy at the EU level for the capital of Europe, 2. a bureau to coordinate collaboration among the headquarters cities, 3. a comprehensive program for EU states to select new seats or reallocate functions between them, and 4. specific organizational structures at the city level that allow for a participatory and democratic integration of European institutions within host cities. 11European cities have engaged in aggressive competition over the location of the EU headquarters since the 1950s. The presence of European institutions has brought economic and symbolic benefits to their host cities and nations. But national and local authorities have not dared reject EU requests in the fear that the organization might leave the city. As a consequence, Brussels in particular has seen many negative effects from hosting European institutions in the absence of a decision on a permanent headquarters: the growth of undistinguished monofunctional administrative zones, the destruction of neighbourhoods, and increased socio-economic disparities. In their anxiety over losing European institutions, combined with their desire to attract a large number of them, host nations have avoided building rapid train lines between the seats. They have thus effectively blocked the emergence of a deliberate and functional polycentric policy. 12A policy for the polycentric development of European cities already exists on paper. The ministers of the members of the European Union in 1999 approved the European Spatial Development Perspective (ESDP), an initiative to mediate cities’ entrepreneurial undertakings and promote a balanced and polycentric system of towns and cities to transform the disparate European space into a polycentric network. The ESDP, however, does not explicitly address the issue of the polycentric capital. 13A spatial policy for a polycentric European capital is necessary for the European institutions, for the cities that host them, and the cities that will host them in the future. It would tie the political EU capitals into the larger economic network of European cities, and it would balance the existing competition between cities with collaboration among the seats. 14The existing pattern of decentralization offers real potential for collaboration and the establishment of a true network of headquarters cities to lobby for common interests and exchange knowledge about common problems. An example of how this might work is the Regio Randstad in the Netherlands, in which the country’s four largest cities and their surrounding areas voluntary cooperate and informally collaborate with each other. It has now set up a common office in Brussels to lobby the EU. Such inter-city collaboration among host cities and their citizen could foster polycentric policies, possibly including a common position for cities hosting EU institutions, standards for the organization of urban and architectural competitions for EU buildings, exchanges of civil servants, EU festivals occurring at the same time in multiple locations, and collective citizen initiatives. 15In particular, a “headquarters cities bureau” could offer common representation for the host cities to the EU as well as common defense of their interests and ideas. It could help cities internally as well: aiding them in creating European districts that are lively areas that have meaning for all European citizens, for example, or making sure that if an institution changes its location that abandoned buildings and structures are reused. The government of the Brussels-Capital Region, the largest headquarters city and host to the most important organs, could initiate such collaboration. 16The choice of location for a EU headquarters is a very competitive affair, as is the decision about reallocating European organs between host cities. There are, however, no standard guidelines for this choice. Instead, the “application” to the EU is largely a marketing campaign expressing the cities’ determination to play major roles in the European urban network. Such a campaign reflects urban management concepts based on economic principles rather than citizens’ interests. 17Consider, for example, the applications submitted by the cities for housing FRONTEX, the newly created European Agency for the Management of Operational Cooperation at the External Borders of the Member States of the EU. The brochure prepared by the Ministry of the Interior of the Republic of Estonia boasts about its city’s favorable geography and history, its location at the centre of international communication axes, and its rapid development of IT solutions. This marketing document echoes the hype of economic promotion. Not surprisingly, then, the decisive factors in FRONTEX’s final selection of a city (Warsaw) were European distributive politics (aimed at satisfying all member states), political maneuvering, and economic interests. 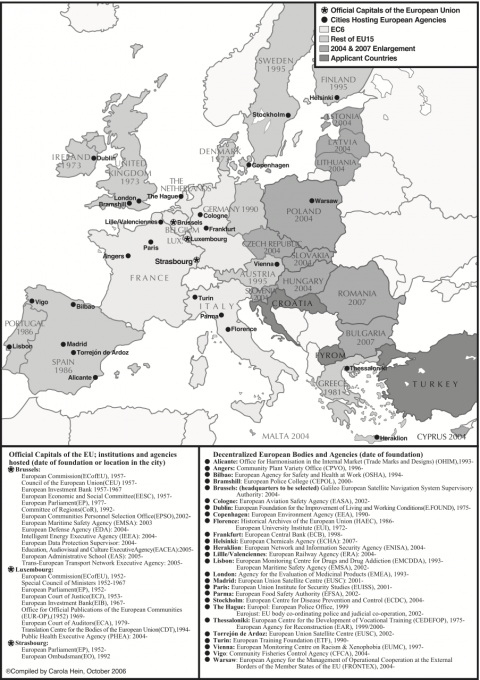 18These factors also shaped the selection of host cities for EU headquarters in the 1950s as well as the reallocation of functions between them. Therefore a transparent strategy for the selection of new headquarters and the reallocation of institutions, one that takes into account the voices of concerned cities and citizens, must complement a polycentric headquarters policy. 19European institutions do not have the same spatial control over the territories they occupy as sovereign governments. As the EU starts to formulate policies for its own locations, it needs to develop an appropriate aesthetic and political architecture of its headquarters buildings and districts in dialogue with its citizens and in response to local interests and preferences. A comprehensive international urban forum modeled on the Stadtforum in Berlin, bringing together all stakeholders, would give greater legitimacy to the EU, create a counterweight to what is often perceived as a democratic deficit, and allow for deliberate construction of the European capital as a local and citizen initiative. These stakeholders would include local European institutions, the national government, regional and communal players, representatives of civil society and the private sector, citizen groups, and the media. 20With Brussels leading the way, each host city could convene its forum to discuss the integration of European institutions, among other urban issues, and to formulate clear guidelines for the construction of European districts that have support from all constituencies. Such a process could help promote the emergence of identifiable European buildings that contribute to the creation of European symbolism and identity. 21In Europe, the location and form of a nation’s capital city not only serve functional, administrative purposes but also establish a national identity symbolically. All member states have carefully designed their capital cities and have used spaces in them to assert national identities. The EU has treated its institutional buildings, however, as administrative seats, ignoring important questions of design and symbolism. One result is that European buildings hardly differ from other unremarkable office buildings. Most of them – including the Parliament building in Brussels, supposedly the most symbolic of all European structures – have been developed by investors, without architectural competitions or other means of public involvement. Developers take them on as speculative projects, largely without concern for European symbolism and imagery. 22Europe-wide discussion on the relocation of the European Parliament provides citizens and other stakeholders with an excellent opportunity to initiate a new approach to the question of a capital for Europe. 24Taking the question of a single seat to the citizens is an innovative move based on Article 47 of the proposed constitution, which aims at fostering participatory democracy. It is also an appropriate move for an institution trying to increase its political clout among other EU organs and seeking further recognition among its citizens. However, the argument provided – the costs caused for the taxpayer – seems insufficient if not inappropriate to these goals. In fact, the analysis that underlies it is not comprehensive and a disservice to the citizens of Europe. 25While the website presents facts and figures on the multiple Parliament seats, it does not reflect on the needs and necessities of the host cities and their inhabitants and does not explore what the move of an institution of several thousand people might mean for the cities that host it, or for their citizens. It therewith highlights not only the absence of spatial concepts for Europe, its cities, and headquarters, and the absence of an overall vision for the siting of European institutions, but also the fragmentation of the European organs each of which pursues its own building policy. It also underlines the nonexistence of interactive structures that include European and local stakeholders. In all of these ways, it foregoes an important opportunity for the Parliament to establish itself as an identity-building institution for Europe. 26The oneseat initiative has reached its goal of a million signatures necessary to put the issue before the European institutions on September 18th, 2006, making it the first such undertaking ever. So far, commentators have ignored questions on the nature of European spatiality, the relation between politics and space, and the role of headquarters cities in that space. To inspire a new era for the capital of Europe, the European Parliament, and its main headquarters, Brussels, the oneseat initiative could combine its call for a single location with an innovative demand for a comprehensive plan that takes into account the needs and interests of all host cities involved. In accordance with the European slogan, “unity in diversity,” a truly European plan could give the Parliament the opportunity to initiate collaboration with and among host cities and citizens. In turn, this work has the potential to establish the Parliament as an initiator of European ideas, and to spur architectural and urban forms promoting European identity and symbolism.